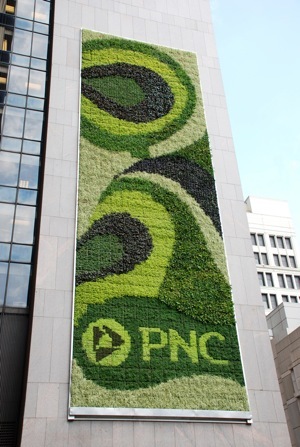 PNC now holds the title for the largest living green wall in North America currently hanging on the exterior of their Pittsburgh headquarters building located at One PNC Plaza. 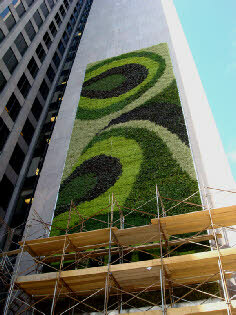 With approximately 14,448 plants covering 602 modular panels, the 2,380 square-feet living mural really livens up the 30-story building. The eight varieties of plants, installed by locally sourced (within a 500 mile radius of downtown Pittsburgh) materials and labor, only need 15 minutes of irrigation per week. Not only does it look pretty, its also doing some work- reducing the ambient temperatures of the south-facing wall by 25%. Not only that, PNC has constructed more green United States Green Building Council LEED certified buildings than any other company in the world with a count of 64 Green Branch locations and two office buildings. It would be great to follow this green wall through the seasons, to see the different blooms, colors and cycles of the chosen plants, I am sure they are stunning. A good example for other corporations looking to improve their green image with real substance, green innovation is a desirable characteristic. I hope to see more like this in the future!